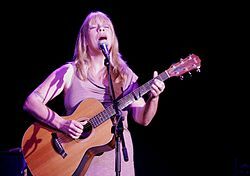 Rickie Lee Jones (born November 8, 1954) is an American vocalist, musician, songwriter, producer, actor and narrator. Over the course of a career that spans five decades, Jones has recorded in various musical styles including rock, R&B, blues, pop, soul, and jazz. Jones is a two-time Grammy Award winner. Additionally, she was listed at number 30 on VH1's 100 Greatest Women in Rock & Roll in 1999. Rickie Lee Jones was born the third of four children to Bettye and Richard Jones, on the north side of Chicago, Illinois, on November 8, 1954. Her paternal grandfather, Frank "Peg Leg" Jones, and her grandmother, Myrtle Lee, a dancer, were vaudevillians based in Chicago. A singer, dancer and comedian, Peg Leg Jones' routine consisted of playing the ukulele, singing ballads, and telling stories. Jones' father, one of four children, was a WWII veteran. A singer, songwriter, painter, and trumpet player, her father worked as a waiter. Her mother, Bettye, was raised in orphanages in Ohio with her three brothers until she was old enough to leave. Bettye and Richard met in a drugstore coffee shop. The family moved to Arizona in 1959, and the landscape provided imagery ("Last Chance Texaco", "Flying Cowboys") for her early music. She grew up riding horses, studying dance, and practicing swimming with her AAU coach before and after school. When she was 10 years old the family moved to Olympia, Washington, where her father abandoned them. Jones dropped out of school in the 11th grade, took the GED test and enrolled in college in Tacoma. She moved to Huntington Beach, California, on her 18th birthday, and then to Venice, California, where she met boyfriend Mark Vaughan, who supported her during her formative years. She worked at odd jobs and enrolled in Santa Monica College, studying anthropology and music. Nick Mathe, a neighbor, took an interest in Jones' music and helped her get publicity photos with Bonnie Shiftman who was then at A&M, and in their off hours the three of them shot Jones's first photos. Jones played music in showcases, worked with cover bands in clubs, and sat in with Venice jazz bands. In 1977, Jones met Tom Waits at The Troubadour after her friend Ivan Ulz' show in which she had sung her father's song "The Moon is Made of Gold", and a few of her own songs. Jones and Waits were lovers at the outset of her career, creating a lifelong association with one another. Jones also met Chuck E. Weiss, who would figure prominently in her early career. In early 1978, through the efforts of Ulz, she came to the attention of Dr. John and Little Feat's Lowell George. Ulz introduced Lowell George to Jones' composition "Easy Money" by singing it to him over the telephone. George recorded her song for his first solo record, Thanks, I'll Eat it Here in 1978. It became the only single for George's final record before his death. A four-song demo of material was circulated around the L.A. music scene in 1978, with Emmylou Harris later recalling that she had heard an early version of "The Last Chance Texaco" on the demo tape. The recordings came to the attention of Lenny Waronker, producer and executive at Warner Bros. Records, and Tommy LiPuma. Jones was courted by the major labels, and after a bidding war, Jones chose Waronker because of his work with Randy Newman, and because, she said, she had a vision of standing in his office the moment she saw his name on the back of Newman's Sail Away album. Waronker signed Jones to Warner Brothers Records for a five-record deal. Work commenced on her debut album, co-produced by Waronker and Russ Titelman. Following a successful world tour, Jones appeared on the cover of Rolling Stone magazine. The announcement of Lowell George's death appeared in the same Rolling Stone cover featuring Rickie Lee Jones crouching in a black bra and white beret – an issue that would become the largest selling issue in the magazine's history up to that time. In 1980, Francis Ford Coppola asked Jones to collaborate with Waits on his upcoming film One from the Heart, but she balked, citing the recent breakup (that had occurred sometime between late 1979 and early 1980). Coppola responded that it would be perfect for the film, since the two main characters in the film are separated, and he asked her to reconsider. Jones still refused the job, a decision she later admitted to regretting. It was then that Waits met his future wife, and Jones began work on her follow-up album, Pirates, written and recorded partly in reaction to the break-up of her relationship with Waits. After Waits and Jones broke up, Jones became involved with her friend Sal Bernardi, who had inspired the song "Weasel and the White Boys Cool". He remained a personal and musical partner for decades. After moving to New York City, Jones spent the majority of 1981 working on "Pirates". The songs were written between September 1979 and June 1981 – when the last lyrics to "Traces of the Western Slope" and the last bass on "A Lucky Guy" were put down. The recording sessions finally yielded "Pirates" in July 1981. The songs included "We Belong Together" and "A Lucky Guy", both inspired by Waits. Donald Fagen of Steely Dan, Randy Newman, the Brecker Brothers, and Steve Gadd were a few of the musicians who performed on the album. Rolling Stone remained a fervent supporter of Jones, with a second cover feature in 1981; the magazine also included a glowing five-star assessment of Pirates, which became a commercially successful follow-up by reaching No. 5 on the Billboard 200. A single, "A Lucky Guy", became the only Billboard Hot 100 hit from the album, peaking at No. 64, but "Pirates (So Long Lonely Avenue)" and "Woody and Dutch on the Slow Train to Peking" became minor Top 40 hits on the Billboard Mainstream Rock chart. More important, historically, is the fact that in America "Woody and Dutch..." became a kind of commercial mainstay. The finger snaps and jive talk beat were imitated in advertisements for McDonald's, Dr. Pepper, and others. In 1983 Jones lived in Paris for four months, writing new material for her third full-length solo album, The Magazine. She began to pursue jazz standards, recording "The Moon Is Made of Gold", which was written by her father, and "Autumn Leaves" for Rob Wasserman's album Duets in 1985. Jones took a four-year break from her recording schedule, largely attributed to the deaths of her mentor Bob Regher and her father, Richard Loris Jones, that same year. Jones returned to the United States in 1987 after a tour of Israel and Norway, and the imminent birth of her daughter brought her home to Ojai, California. In September 1988, work began on her fourth solo album following another Grammy nomination for her Wasserman collaboration "Autumn Leaves". With songs dating from the mid-1980s, Jones teamed up with Steely Dan's Walter Becker to craft Flying Cowboys, which was released on the Geffen Records label in September 1989. Jones also included some writing collaborations with her husband Pascal Nabet Meyer, Sal Bernardi, and [The Horses]]", co-written with Becker, was featured in the movie Jerry Maguire and became an Australian No. 1 hit single for Daryl Braithwaite in 1991. The album made the US Top 40, reaching No. 39 on the Billboard 200, with the college radio hit "Satellites" making it to No. 23 on the Billboard Modern Rock Tracks chart. Jones ended the decade on a high note with her duet with Dr. John, a cover of "Makin' Whoopee", winning her second Grammy Award, this time in the category of Best Jazz Vocal Collaboration. Soon after, The Orb issued "Little Fluffy Clouds", featuring a sampled Jones interview. However, Jones' record company objected to the unauthorized use of her voice and pursued the issue in the legal system. In 1992 she toured extensively with Rob Wasserman, with whom she had collaborated in the mid-1980s. Jones' first solo shows in 1994 paved the way for her "unplugged" acoustic album Naked Songs, released in September 1995 through a one-off deal with Reprise Records. The album, which reached No. 121 on the Billboard 200, featured acoustic re-workings of Jones classics and album material, but no new songs. After starting up her official website, Artemis issued an archival Jones release, Live at Red Rocks, in November 2001, featuring material recorded during the Flying Cowboys era tour of 1989–1990, including a Lyle Lovett duet. In May 2010 Jones performed at the Sydney Opera House as part of the VIVID festival. On September 18, 2012, Jones released The Devil You Know on Concorde Records. The Devil You Know includes a collection of covers produced by famed musician Ben Harper. Her 'solo' version of Sympathy for the Devil is another example of the artists ability to totally reinvent a song. Her impact on artists doing covers continues to be quite phenomenal. before Jones' pop singers did not sing jazz covers, and female singer songwriters did not wear fishnet stockings. Her single "On Saturday Afternoons in 1963" appeared in an emotional scene of the television series House MD. The episode was titled "Paternity". 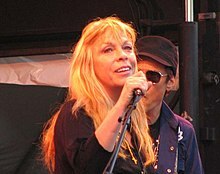 In 2015, Rickie Lee Jones founded her own label TheOtherSideOfDesire - and released her 13th studio album, the New Orleans' inspired The Other Side Of Desire.featuring a variety of New Orleans players. IHer first album completely made of original self-penned material since 2003. She presently lives in New Orleans. ^ "VH1:'100 Greatest Women of Rock & Roll'". Rockonthenet.com. 1999. Retrieved 2014-04-18. ^ "Rickie Lee Jones". Retrieved 7 July 2015. ^ AllMusic review. "Thanks, I'll Eat It Here". Retrieved 7 July 2015. ^ "Pirates". Retrieved 7 July 2015. ^ Hilton Als. "Biography". Rickieleejones.com. Retrieved 2014-04-19. ^ Als, Hilton. "Biography". RickieLeeJones.com. Retrieved 15 April 2016. ^ Als, Hilton (April 10, 2000). "The Musical Life Rickie Lee Jones and Four Guys in a Studio". The New Yorker. p. 33. Archived from the original on 2000. Retrieved 15 April 2016. ^ Jones, Rickie Lee (November 19, 2006). "Rickie Lee Jones: What Happens After Ugly Man?". Down With Tyranny. Retrieved 15 April 2016. ^ "Rickie Lee Jones – Sydney Opera House – Music – Time Out Sydney". Au.timeout.com. Retrieved 2012-04-13. ^ "US Charts > Rickie Lee Jones". Billboard. Retrieved 2012-06-10. ^ "US Charts > Rickie Lee Jones". Allmusic. Retrieved 2012-06-10. ^ "UK Charts > Rickie Lee Jones". The Official Charts Company. Retrieved 2012-06-10. ^ "US Certifications > Rickie Lee Jones". Recording Industry Association of America. Retrieved 2012-06-10. ^ "Certified Awards Search: Rickie Lee Jones". British Phonographic Industry. Archived from the original (To access, user must enter the search parameter "Rickie Lee Jones" and select "Search by: Keyword", with the other two set to "All") on June 4, 2011. Retrieved 2012-05-28. ^ "Rickie Lee Jones Sets Tour". Billboard. October 27, 2003. Retrieved 2012-06-10. ^ "New Releases: June 23, 2015". Pause&Play. Retrieved 2015-04-07. ^ "Sur les traces des versants ouest". Jacquesbenoit.com. Retrieved 2014-04-18.